Photograph of spring salmon fishing from The Angler’s England. 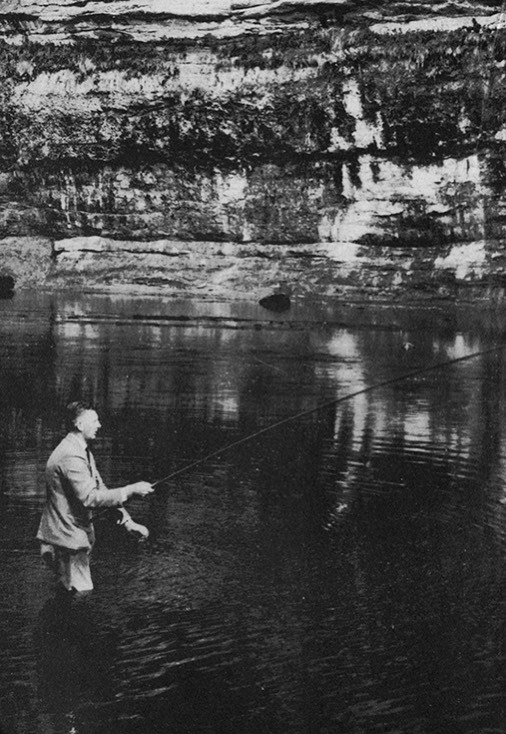 Patrick Reginald Chalmers was one of the finest angling writers of the twentieth century. Born in 1875, Chalmers spent his boyhood at Aldbar Castle near Brechin, and was brought up from an early age to both fish and shoot. After schooling at Rugby he worked in London for the family merchant banking firm of Chalmers Guthrie & Co, becoming Managing Director in 1901. He retired in 1922 to live for the rest of his life at a house called Eskmount in Goring-on-Thames, the house he had bought on his marriage in 1917.Most of his writing was done at Eskmount. He died on 12th September, 1942 after a short illness. His best known angling works are The Angler’s England, A Fisherman’s Angles, Where the Spring Salmon Run and his most popular, At the Tail of the Weir, originally published in 1932, which is entirely about fishing the Thames. Chalmers loved the Thames and At the Tail of the Weir is his tribute to the river and its fish. He championed the sport of the ‘ordinary’ angler and was proud to be one himself, despite writing a book about salmon fishing. He was strongly opposed to the re-introduction of salmon to the Thames as it might restrict fishing access to coarse fishermen. One of his good friends was the celebrated Thames angler A. E. Hobbs, perhaps the greatest ever exponent of Thames trout fishing, who wrote Trout of the Thames in 1947. To reserve a copy of the forthcoming At the Tail of the Weir, click here.